Hi hi hi...welcome to Day 3 of *Get Your Christmas Craft On*. Hope you'e been inspired so far to get a little festive and to start planning for the holidays. Today is another *use what you have* craft post. 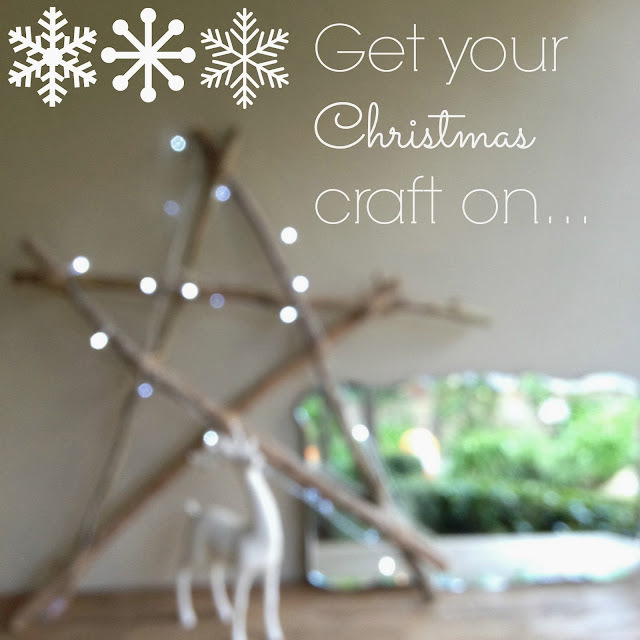 Christmas needn't cost a fortune each year...creating simple, beautiful pieces for your home is totally do-able and incredibly rewarding. Although I'm partial to a little glam at Christmas- for me it only works when sitting alongside natural styling, and simple hand made pieces...think nordic, coastal, minimal glamour! 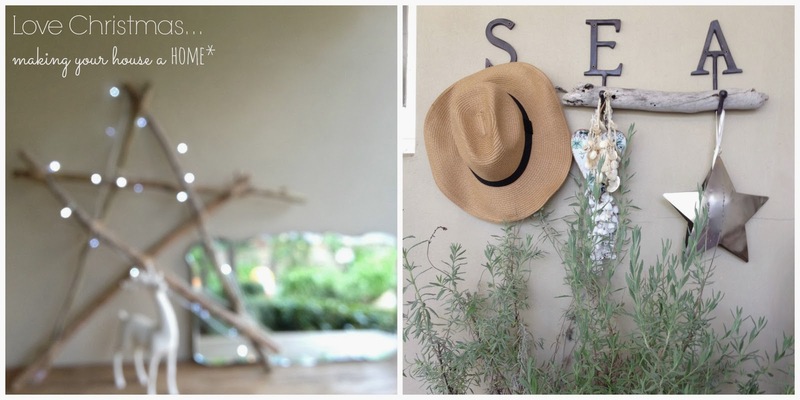 We find our garden to be full of inspiration most of the year- I'm always dragging in branches for oversized glass vases on our side board...or sticking large succulents in stainless steel buckets from the hardware store and the like. Whilst I love sweet flowers, I don't tend to have many large vases of flowers around, preferring instead large bunches of greenery, and smaller prettier vases of flowers and colour. So in this project, my eldest daughter made up an oversized wooden Christmas star, from the branches of a crepe myrtle tree we had just trimmed. 5 branches- stripped of any twigs/leaves & of a similar length. A ball of simple brown string- although a beautiful colourful Christmas colour would also be lovely. 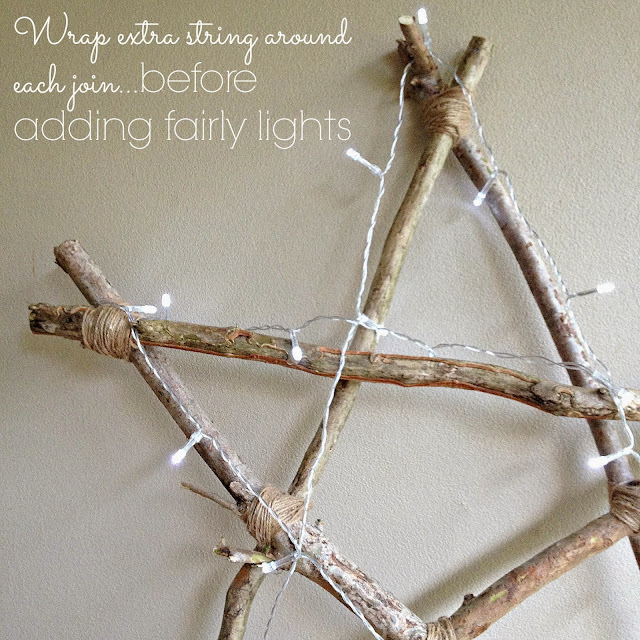 A string of white fairy lights- again if you are all about colour at Christmas, throw on some party lights. 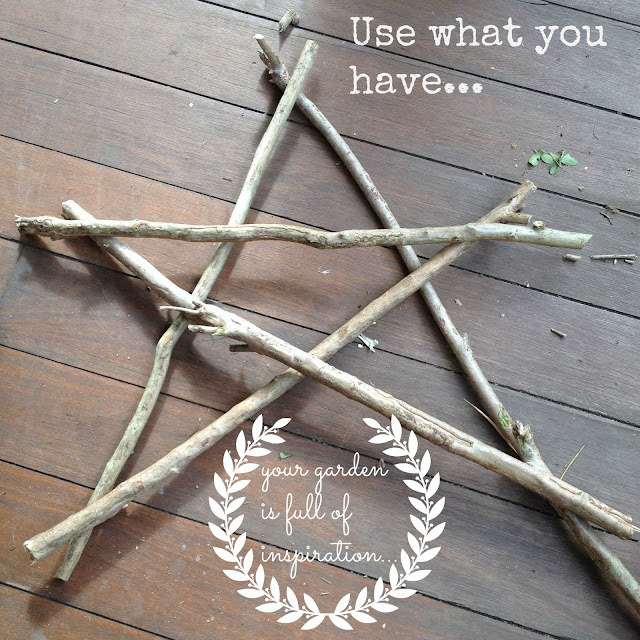 Lay out your sticks in the most visually pleasing star shape- they will sit differently due to slight differences in each stick shape- there will be a *best* way though, so be patient. Knot each corner join (the five points of the star), and then each cross stick (there should be five of these too). sill by the front door etc. We love ours so much that it's been lighting up our home each night since Ella made it...there is nothing like fairy lights to get a home holiday ready! Hope you're inspired to up-cycle again from your garden, or your neighbours, or your mum's...this star will dry in time, and be beautiful for years to come. Simple white butchers paper, brown string or red & white baker's twine, and a hand made wooden star. A few of them strung across a window and entwined with fairy lights would be magic on Christmas Eve...the uses are endless, and the cost nothing but an hour or two of holiday planning. Your home, your crafts, all of it is just beautiful. You do it so effortlessly, I need to take notes a bit more carefully. Happy Holidays Melissa.